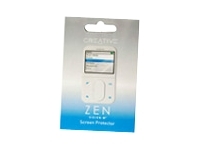 Keeps the screen of the ZEN VISION:M safely protected from the elements and from wear and tear. Easy to put on and to remove, the screen protector's anti-reflective coating reduces glare and reflection under bright lighting, giving you clearer image quality. Its durable hardcoat lets you protect the ZEN VISION:M screen for up to 6 months, and ensures the player remains free from fingerprint smudges.